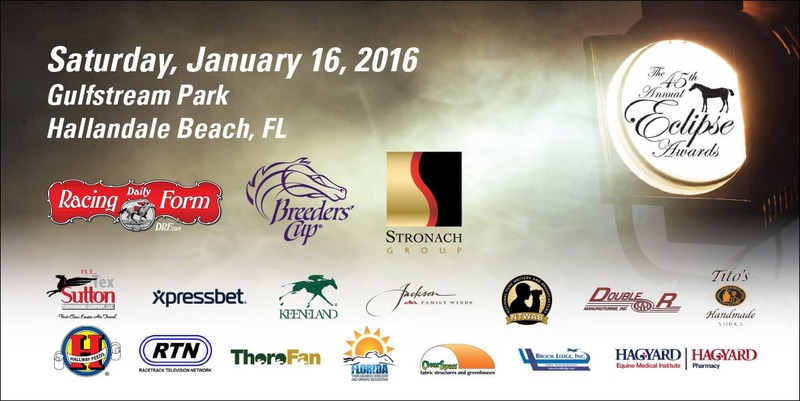 Saturday night’s 45th Annual Eclipse Awards Presented by Daily Racing Form, Breeders’ Cup and The Stronach Group, produced by the National Thoroughbred Racing Association (NTRA), is made possible thanks to the support of 16 sponsors and partners. In addition to its three returning presenting sponsors, The Eclipse Awards is supported by official partners Brook Ledge Horse Transportation, Florida Department of Agriculture and Consumer Services, Florida Thoroughbred Breeders’ and Owners’ Association (FTBOA), Hagyard Equine Medical Institute and Pharmacy, Hallway Feeds, H.E. Tex Sutton Forwarding Company, Jackson Family Wines, Keeneland, the National Turf Writers and Broadcasters, Racetrack Television Network (RTN), Tito’s Handmade Vodka, ThoroFan and Xpressbet. The Eclipse Awards will be held for the fourth consecutive year at Gulfstream Park Racing & Casino in Hallandale Beach, Fla. The official Eclipse Awards After Party, Presented by Keeneland with support from Tito’s Handmade Vodka and Jackson Family Wines, will take place immediately following Saturday night’s ceremony at Frankey’s Sports Bar in The Village at Gulfstream Park. Xpressbet.com and DRF.com will provide coverage of the event via free live streams Saturday starting at 6:30 p.m. ET. The program will also be available on the DISH Network courtesy of RTN. Less than 20 tickets to the Eclipse Awards remain and are available for $400 each. The ticket is good for admission to parties on Thursday, Friday and Saturday nights.